The County Health Rankings are an annual report released by the Robert Wood Johnson Foundation in partnership with the University of Wisconsin Population Health Institute. This year’s rankings were released March 19th and can be found here. The report includes two rankings: health outcomes and health factors. The health outcomes ranking compares counties based on quality of life and length of life. The health factors ranking compares counties based on the degree to which conditions there favor good health. The health factors ranking does not measure health directly, but instead focuses on what influences health. Both rankings are within-state comparisons. Counties are only ranked in comparison with other counties within the same state. There are large differences between states on many health measures. Consequently, rankings are not a reliable guide to a county’s national standing. WHAT SOURCES OF DATA ARE USED TO BUILD THE MEASURES FOUND IN THIS REPORT? The Robert Wood Johnson Foundation does not collect its own data. Instead, they rely on a variety of state and federal sources. Although a new report is released with updated data each year, the underlying data sources are at least a couple of years older than the year in which the report is released. When there is missing data for a county, that county is assigned the state mean for that value. This causes the county’s rank to be brought more toward the middle but is the best guess for that missing data. WHAT MEASURES INFLUENCE THE HEALTH OUTCOMES RANKING? The health outcomes ranking is based on length of life and quality of life. The length of life measure is based on the premature death rate. A premature death is defined as any death that occurs before age 75. Most premature deaths are preventable. The quality of life measure is based on (1) survey data from the federal Behavioral Risk Factor Surveillance System (BRFSS) – specifically, the percentage of respondents who report experiencing poor or fair physical or mental health – and (2) birth outcomes, as indicated by the percentage of low birthweight births from the National Center for Health Statistics. WHAT MEASURES INFLUENCE THE HEALTH FACTORS RANKING? Measures in the social and economic factors domain are most heavily weighted (40%), followed by health behaviors (30%), clinical care (20%), and physical environment (10%). For a full overview of the measures included in these domains, click here. New unranked measures such as “Severe Housing Cost Burden,” “Homeownership,” and “Life Expectancy” have been added. The ranked measure “Diabetes Monitoring” has been removed but “Flu Vaccinations” has been added as a ranked measure. The data sources for “Preventable Hospital Stays” and “Mammography Screening” have been updated and should not be compared to previous years values. Interactive features like trend graphs, measure breakdowns based on racial groups, info buttons for additional information (for example top 5 contributors to premature death), and policy & program lists for individual measures have been added whenever possible. WHAT SHOULD I REMEMBER ABOUT THESE RANKINGS? Health outcomes rankings tell a mixed story for the region. 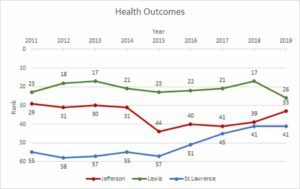 Jefferson and St. Lawrence County rank behind the median county, but have shown steady improvement over the past decade. This year, Jefferson County rose much closer to the top half than it has in past years. Lewis County ranks within the top half of NYS counties. 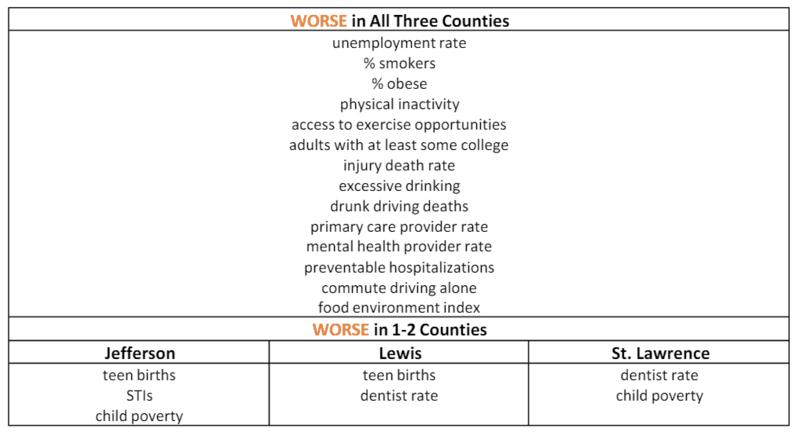 Health outcomes are better than health factors predict in all three counties, indicating that the region may have sources of strength that are not captured in the measures used in this report. Health factors rankings are low for all three counties but improving. Further improvement will depend largely on addressing key social, economic, and behavioral factors such as poverty, employment, education, smoking, alcohol, and physical inactivity. Lower rankings for clinical care have to do with the rurality of the region since, like many rural areas, the region has fewer health care providers per population. New York State is one of the healthiest states in the country and has experienced huge improvements in the health of its residents over the past several decades. Low rankings within New York State do not indicate poor health outcomes or factors compared to the United States as a whole. Our region’s counties would rank higher if they were compared to those of almost any other state. Most of the region’s health problems are consistent with those faced by other rural and small city regions of the United States. The most significant threats to health in the North Country, such as obesity, drug overdoses, and economic problems, cannot not be blamed on unique local decisions or circumstances. HOW DO THE REGION’S COUNTIES RANK ON HEALTH OUTCOMES? HOW HAVE THE REGION’S HEALTH OUTCOME RANKINGS CHANGED OVER TIME? 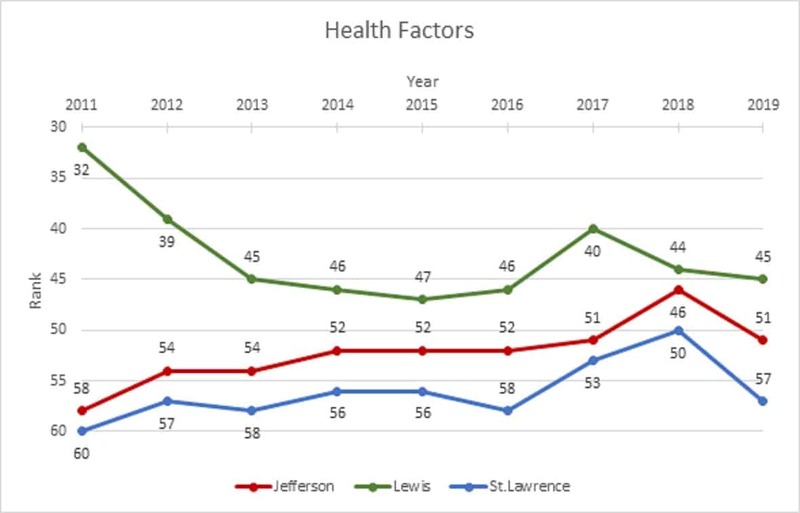 In 2019, Jefferson County improved by 6 places, Lewis dropped by 9, and St. Lawrence did not change in rank. Jefferson County has been improving consistently over the past several years and the 2019 ranking reflects this as well. This is the same rank as last year for St. Lawrence County and is the highest rank they have ever achieved. 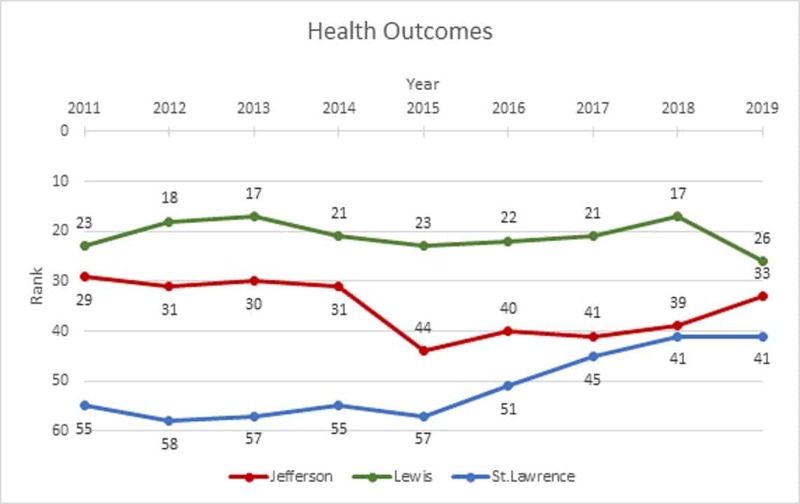 Lewis County consistently ranks higher on health outcomes than the other two counties in the region, however, this was the lowest they have ever ranked. As a smaller population county, Lewis County experiences more year-to-year variation in many measures. WHAT SPECIFIC MEASURES SHAPE THE REGION’S HEALTH OUTCOME RANKINGS? Length of life hurts the ranking in Lewis County, while quality of life hurts St. Lawrence County’s ranking. For Jefferson County, the length of life and quality of life ranks are quite close. Lewis County ranks 10th in the state for quality of life, while both Jefferson and St. Lawrence counties rank in the bottom half of the state for this metric. However, all three counties have a lower percentage of low birthweight births, another quality of life measure used in the rankings, compared to the state. Premature deaths reduce the ranking for all three counties. The leading causes of premature death include cancer, obesity-related chronic disease, transportation deaths, and suicides. HOW DO THE REGION’S COUNTIES RANK ON HEALTH FACTORS? HOW HAVE THE REGION’S HEALTH FACTOR RANKINGS CHANGED OVER TIME? Although their rankings did not improve in 2019, the three counties rankings were no better or worse than they have been on average since 2013. WHAT SPECIFIC MEASURES SHAPE THE REGION’S HEALTH FACTOR RANKINGS? Jefferson County ranks well on physical environment (18th), average on clinical care (31st), but worse on social & economic factors (48th) and much worse on health behaviors (60th). Lewis County ranks well on physical environment (12th), about average on clinical care (35th), but worse on social & economic factors (43rd) and health behaviors (48th). 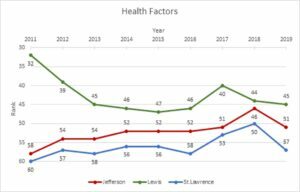 St. Lawrence County ranks above average on physical environment (27th), worse on health behaviors (47th) and clinical care (48th), but much worse on social & economic factors (60th). WHAT ARE OUR REGION’S KEY STRENGTHS & WEAKNESSES FOR FACTORS THAT INFLUENCE HEALTH? Overall, the region’s health factors rankings suffer most for two sets of reasons. The first has to do with key social indicators: fewer adults attend college, more children live in poverty, more working-age adults can’t find employment, and injury deaths are more common. The second has to do with health behaviors: more adults smoke, higher obesity rates, and problems with alcohol use are more common. However, the region also shows consistent strengths compared to the state: Its high school graduation rate is higher, community life is more active, crime is less common, and fewer children live in single-parent households. Fewer adults are uninsured, more adults are getting recommended clinical screenings, and environmental health indicators are generally positive. Previous post NEMSIS v3 ePCR Tips and Tricks!